Reduction of tariffs by Sri Lanka Telecom - A misnomer! The full-page advertisement inserted by Sri Lanka Telecom in the newspapers of October 6, 2007 was ironically titled “Reduction of tariffs by Sri Lanka Telecom”. The monthly rental for Domestic Telephones has been reduced from Rs. 495 to Rs. 345 (i.e. a reduction of Rs. 150), whereas the rental for Business Telephone has been reduced by Rs. 300 (i.e. from Rs. 1,250 to Rs. 950). The discount of Rs. 600 (i.e. no charge for the first 200 units) has now been reduced to Rs. 400. This means an increase of Rs. 200 per month. The net effect of the above mentioned revisions to the monthly rental and billing discount is that Domestic Telephone users will now have to pay an additional Rs. 50 per month whereas the Business Telephone users will enjoy a saving of Rs. 100. (a) The old tariff used a ‘Unit Based’ charging mechanism where each unit was computed on the number of seconds allotted per call during each of the three periods of the day, namely the Peak Period, Economy Period and Discount Period. With the introduction of the new tariff, a ‘Time Based’ charging mechanism (i.e. per second billing) is in operation since November 1, 2007. Although the ‘Time Based’ (per second) billing system is said to be fair by the user, the revised rates which include a ‘start-up-fee’ of Rs. 1.50 for every call and higher charges for calls to Other Fixed Lines & Mobile Telephones will result in a substantial increase in the call charges instead of the anticipated reduction. 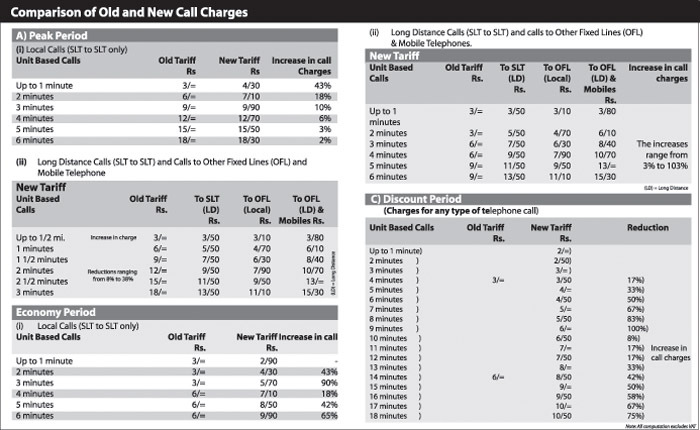 (b) As clearly shown in the Annexure “Comparison of old and new call charges”, a study of the call charges during the different periods indicates that with the exception of “Long Distance” calls during the Peak Period; the first 3 minutes of calls taken during the Discount Period; and a few calls as detailed in (c) below, almost all the other calls will now cost more. The increase in the cost per unit varies from 2% to 103%! A local call (SLT to SLT) lasting 1 1/2 minutes will now cost Rs. 5.70 as against Rs. 6 under the old tariff. Similarly, calls lasting 2 1/2, 3 1/2, 4 1/2 and 5 1/2 minutes will now be cheaper. A Long Distance call from SLT to SLT lasting 1/2 minute will now cost Rs. 2.50 instead of Rs. 3. A local call from SLT to Other Fixed Lines (OFL) lasting 2 1/2 minutes will now cost Rs. 5.50 as against Rs. 6 under the old tariff. Similarly, such calls lasting 4 1/2 and 6 1/2 minutes will now be cheaper. In addition to the increase in call charges mentioned in (3) above, the reduction of one hour from the Economy Period (i.e. Peak Period will now commence from 7 a.m. instead of 8 a.m.) will also result in a substantial increase in the final charge. This period was given to enable people to have long conversations with their near and dear ones. Those who benefited most from this concession were parents whose children were married and living in various parts of the island, the aged and those living alone. They could talk for 9 minutes for just Rs. 3. Alas the new tariff permits only 3 minutes for Rs. 3 and thereafter the charges gallop! Under the old tariff a reduced rate was charged for units exceeding 1000. This concession has now been removed. Based on the six observations given above, one cannot comprehend how the new tariff can bring about an overall reduction of 8.7% as ordered by the Supreme Court. On the contrary, the telephone bills will increase from November 2007. The impact of the new tariff will mostly be felt by the Domestic Telephone users. The Business Telephone users will have the benefit of a bigger reduction in the monthly rental and cheaper calls during their business hours (i.e. Peak Period long distance calls are much cheaper). The worst affected will be those mentioned in (5) above who made use of the Discount Period. The SLT which gave much publicity to a “Reduction of Tariffs” and the TRC owe an explanation to the public how the monthly charges will reduce by 8.7% The revised tariffs should not be implemented until such explanation is given. The easiest way to grant the reduction ordered by the Supreme Court is to compute the charges on the old tariff and then reduce 8.7% from the amount chargeable.